"Marriage How It Affects Men & Women Differently"
The title of John Gray's book Men are from Mars, women are from Venus says it all, when it comes to the differences between men and women. This difference becomes even more apparent when we talk about marriage aspect & how it affects men and women differently. According to research done, it has been established that married people have better mental health and also have a longer life. Marriage & Salary : As per the results of the 1992 study titled "The Effects of Marital Status and Wives Employment on the Salaries of Faculty Men -- the (House) Wife Bonus", it was established that married men tend to earn more as compared to unmarried ones. On the contrary, on an average, unmarried women tend to earn more than married women. 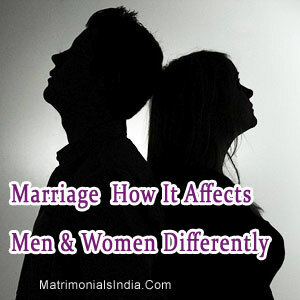 Marriage & Health : As per the 2004 study titled "Marital Status, Marital Transitions and Health: A Gendered Life Course Perspective," published in the Journal of Health and Social Behavior, it was found that marriage had a positive impact in men's health. Another study titled "Gender, the Marital Life Course, and Cardiovascular Health in Late Midlife," (Journal of Marriage and Family) conducted on the same lines found that married women were at an increased risk of cardiovascular diseases. Marriage & The Difference In Basic Thinking Of Men And Women : One of the basic differences between women and men is in the way they think. On an average, an average woman needs verbal declarations of love, yet when it comes to emotions & feelings they expect their partners to figure it out themselves. On the other hand, men expect their partners to be forthright when it comes to their needs and wants. This can create conflicting situations in a married couple's life. To ensure a smooth marriage, there is need for both the partners to be understanding about each other's limitations. Communication is the basis of a strong marriage. The partners should take out time regularly to sit with each other and discuss the problems which may be affecting their marriage. As any marriage counselor will tell you communication and compromise are the pillars that hold together a successful marriage.